As a Michigan homeowner that wants light your home with quality, it’s important to complete cost-effective home improvement projects to build value. When it comes to completing quality upgrades for your house, designer lighting options are always a great choice to improve the aesthetics of your space while illuminating your daily activities. One way to create a dramatic change while enhancing a space is to install a modern chandelier. These ornate lighting fixtures are ideal for a wide range of rooms, providing a timeless beauty that is sure to be a conversation-starter for your guests. The Lighting Corner is proud to provide unbeatable indoor lighting to Jenison homes and beyond. Our lighting showrooms in Grandville and Grand Haven are fully stocked with the best products and service to ensure that you are pleased with the outcome of your home lighting project. 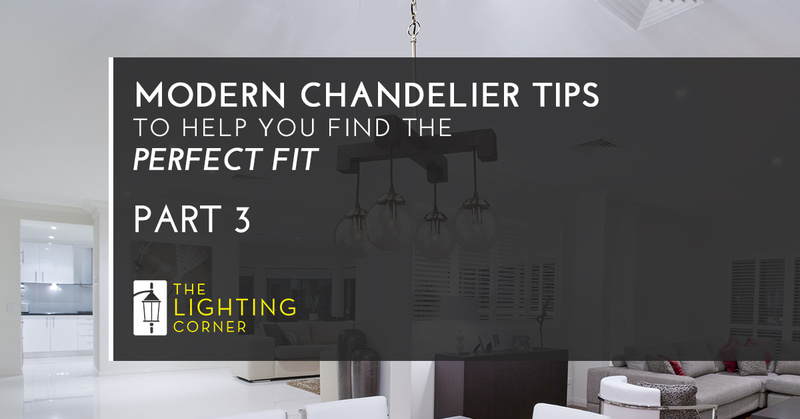 We want you to find the best fixtures for the long term, which is why today’s blog will conclude our three-part look into chandelier tips. Beyond the material composition of your modern chandelier, it’s also important to find the style that best fits your unique home. There are many styles available, each providing a unique look that is sure to be a conversation starter for guests at your table. Be sure to find a chandelier style that matches your home’s decor, but also be sure to invest in a product you truly love. Traditional. Match the look of past chandeliers with this Neoclassic option. Decorative, refined, and elegant, these fixtures are sure to meet your needs. Contemporary. Modern chandeliers rely on any styling from the past 100 years. Instead of ornate elements, you’ll find durable and cost-effective products that can meet your needs and your budget. Transitional. You can meet in the middle with transitional chandeliers that find a balance between contemporary and traditional styles. Ideally, these fixtures will provide a feeling of comfort for your home. Industrial. There has been a growing trend for industrial chandeliers, relying on sturdy components to create a simple and utilitarian fixture. In many cases, this minimalist design will enhance the theme of your room. Victorian. Those looking for a luxurious lighting fixture can benefit from victorian chandeliers, boasting brass fixtures that are beautiful and intricate. Rustic. When you think of a chandelier in a cabin, this is the style that comes to mind. Featuring iron, wood, and a variety of big-game antlers, cabin lighting fixtures such as this can help to establish your off-the-trail style. Crystal. The classic chandelier, this fixture is comprised of varying styles of crystal to customize the perfect look for your home. No matter what era your crystal chandelier was styled after, remember that this classy peace is sure to dazzle guests. There are many more aspects to consider for your modern chandelier, ranging from the shades used to the fixture’s weight for your home. Remember that anything over 50 pounds will need to be secured to a proper beam or fixture for the safest results. No matter the size or scope of your chandelier project, it’s important to remember that expert assistance can always be valuable. Our designer lighting experts are here to work with you every step of the way, offering honest and cost-effective guidance to create the best outcome for your home and your budget. The Lighting Center is proud to be your trusted source for indoor lighting in Jenison, Grandville, Grand Haven, and beyond. Our lighting showrooms are stocked with the best products and staff to provide comprehensive support for your home renovation needs. Stop by one of our locations for help today or contact us for assistance!